Is UK going to ban The Muslim Brotherhood? The Muslim Brotherhood, which was founded in Egypt in 1928, was branded a terrorist group by the Egyptian authorities last year. It had been banned during most of the latter part of the 20th century up until the Arab spring which saw the overthrow of Hosni Mubarak as Egyptian president. 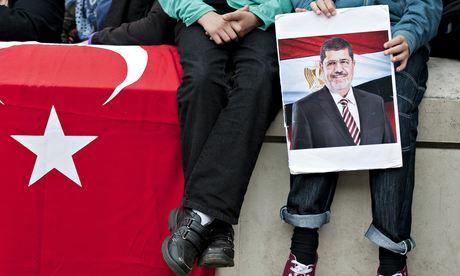 British officials are saying it is “possible but unlikely” that the Muslim Brotherhood will be banned in Britain on the grounds of terrorist links. Foreign Office officials figures have until now resisted proscribing the organisation on the grounds that that could encourage extremists. “The truth is that this is a large, disparate organisation that takes different forms in different countries,” an official told the paper. The security services are said to take a more hardline view. Sir Richard Dearlove, the former head of MI6, has reportedly described the Muslim Brotherhood as “at heart a terrorist organisation”. Next When the US leaves Afghanistan – what will happen?